Yesterday’s signals were not triggered, as there was insufficiently bullish price action when the price reached 1.3119. Trades may only be entered between 8am and 5pm London time, over the next 24-hour period. Long entry after the next bullish price action rejection following the next touch of 1.3119 or 1.3047. Short entry after the next strongly bearish price action rejection following the next touch of 1.3182. I had a weakly bullish bias yesterday, which ended up working but only after the price broke below the first support level before turning around following some sharply bullish price action. The picture is essentially the same today, but the price action looks extremely weak. Of course, there is major news coming in a few hours from the Bank of Canada, which is likely to cause a big spike in volatility and might push the price anywhere. I have no directional bias today. 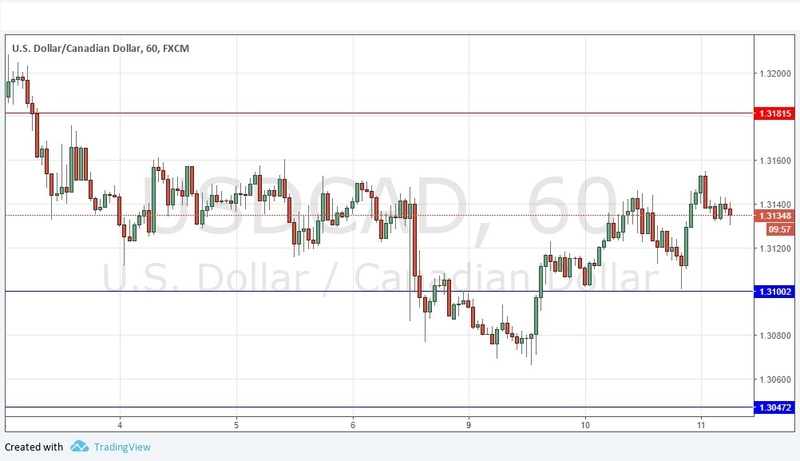 Concerning the CAD, the Bank of Canada will be releasing their Monetary Policy Report, Rate Statement, and Overnight Rate at 3pm London time. Regarding the USD, there will be a release of Crude Oil Inventories data at 3:30pm.